Newcastle Brough Park only operated for 4 years before the war. 1929 - 1930 and 1938 - 1939. This page concerns itself with the earlier period. It has a few other items outside the first period 1929 - 1931. Gosforth operated until 1931. 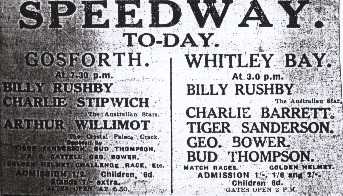 My Pre World War Two Part 2 page concentrates on the 2nd period 1938 -1939 by which time Whitley Bay and Gosforth were fading memories and Newcastle's east end stadium "Brough Park" had become the only speedway venue on Tyneside. Born 7th November 1911 - Gordon Died December 2008. 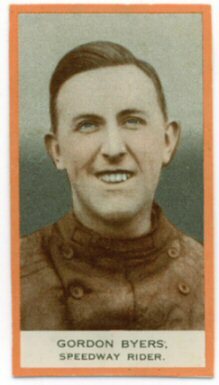 Sunderland born Gordon was a member of the 1929 Newcastle Brough Park team. 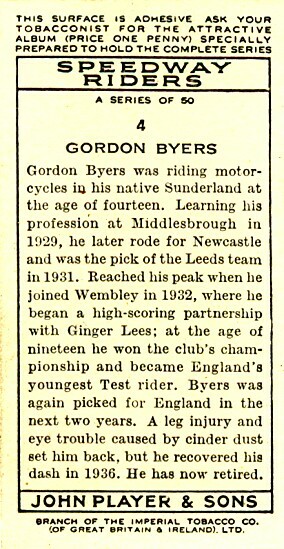 In fact Gordon was the first rider to win a race at the new venue in Brough Park when he was just 17 years old! 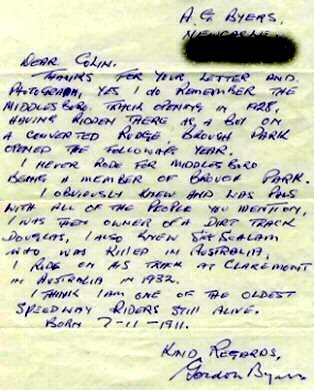 Here is Gordon's letter to my friend Colin Greenwell. I have obliterated Gordon's address to preserve his families privacy. I can say that Gordon born Sunderland lived in Gosforth a suburb of Newcastle. 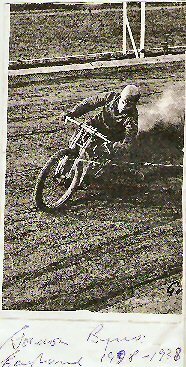 I would like to think that this photograph was showing Gordon winning the first ever race at Brough Park but I don't know when it was taken? It is from Gordon's own collection so many thanks to our most senior rider. Gordon is centre at the back, these were his England team mates whom toured New Zealand and Australia in 1932 -33. care to name them anyone? 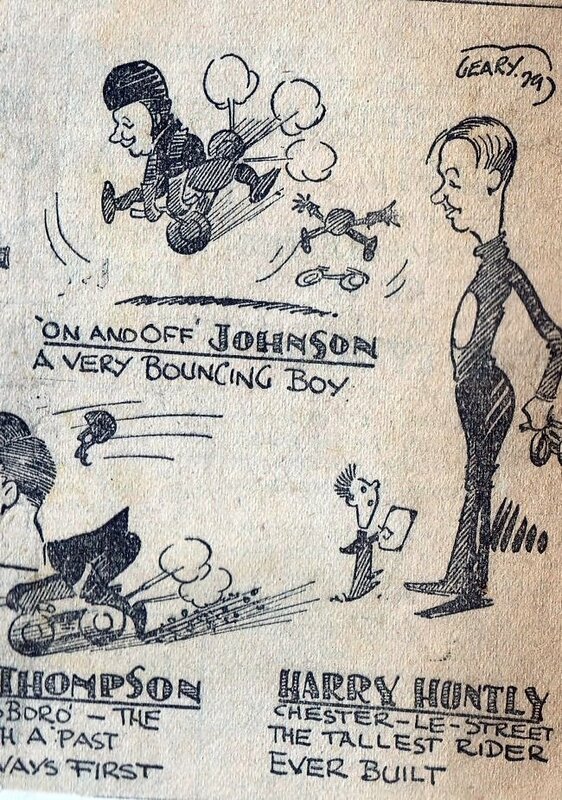 Jim Henry says: Harry Whitfield and Bluey Wilkinson are in this shot. One of Gordon Byers photographs. 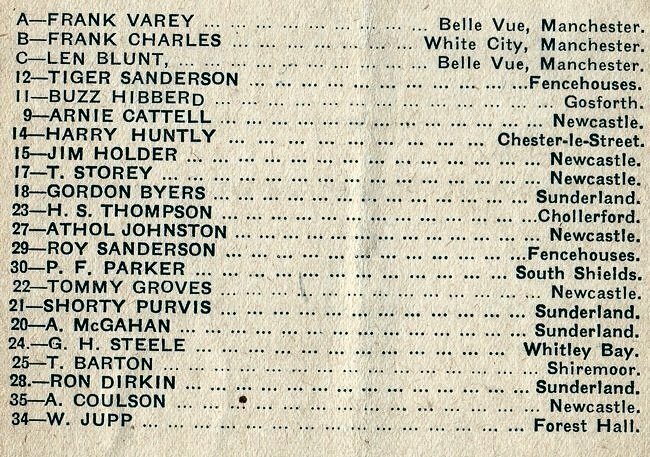 I only know 3 names here. 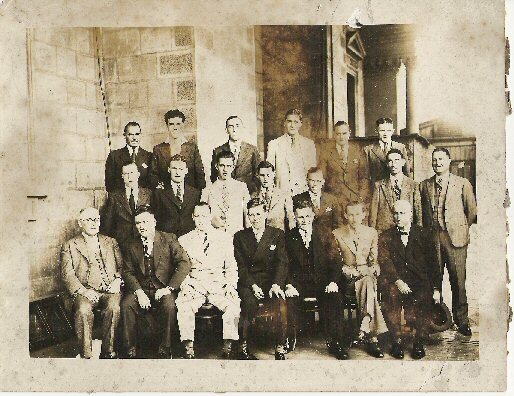 Jack Ormston seated in centre, Jack Parker and Johnnie Hoskins so if you can name the rest and say what the occasion was then please get in touch. Gordon died late December 2008 aged 97. Jim Henry says: Back row second left Lionel Van Pragg ? 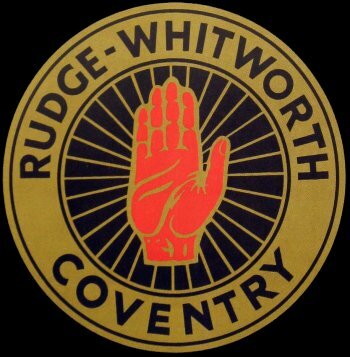 extreme right Bluey Wilkinson? to right of Hoskins Viv Huxley ? 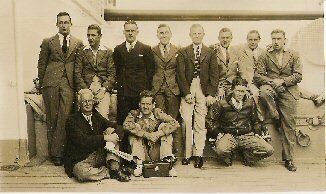 Terry Stone says: Back row: Bill Pitcher Lionel van Prague. Gordon Byers ? Cliff Parkinson Bluey Wilkinson George Greenwood. next may be? Arthur Atkinson next? Norman Parker Phil Bishop. Wally Lloyd. next? ? Front row ? ? Jack Ormston. Jack Parker . Johnnie Hoskins. Frank Arthur. ? I am new to the web, hope this is ok . Good to look at the days from the past. The old picture is from 1933, all the best from the man in black. Newcastle and Middlesbrough occupying lowly spots in the 1929 Northern League tables. I believe the left hand table shown above is of Newcastle Brough's exploits and the right hand table shows Newcastle Gosforth. Boro closed at the end of 1929. 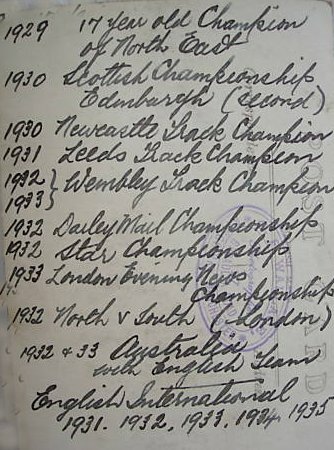 So speedway arrived at Brough Park on 17th May 1929 and Newcastle Brough contested the English Dirt-Track League during 1929, finishing 9th out of 11, but the promoters "Newcastle Motor Racing Club Ltd.", dropped out of the league and by 4th July 1930 the promoters pulled out. Brough Park had just made its first speedway shutdown. 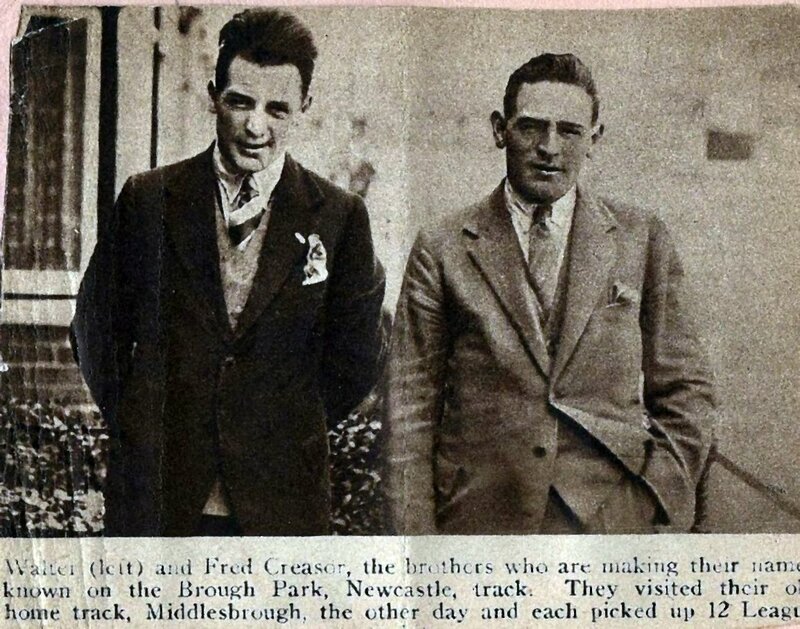 Middlesborough born brothers Walter and Fred Creasor became Brough Park's first big names when they signed up for the Newcastle outfit's inaugural season 1929. The brothers are reported to have had a butchers business on Teesside and they certainly "carved up" the opposition at Brough and the other northern tracks. Middlesbrough's influence in the North East was immense in 1929. 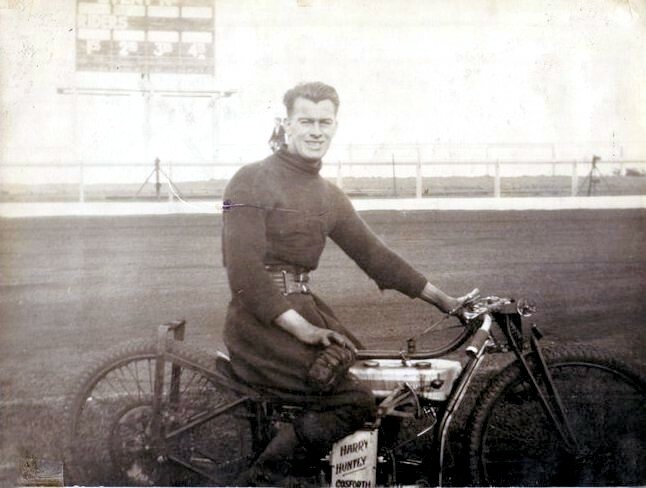 Teesside born riders Walter and Fred Creasor and Phil Blake were in Newcastle's first ever team. 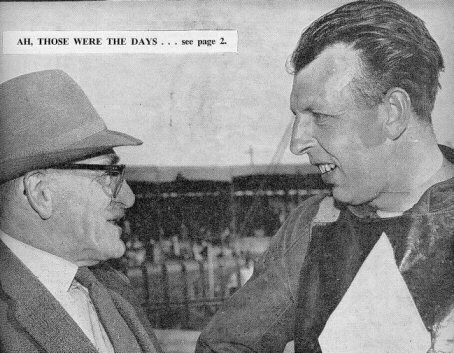 Here's Freddie Creasor in 1961 chatting to Newcastle's Peter Lloyd. 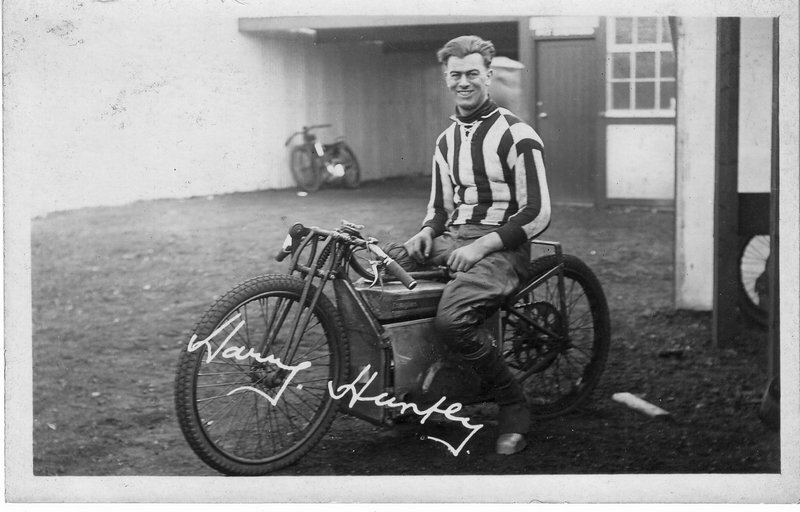 A picture from Brough Park taken during June 1929, this is an unknown Newcastle rider who had actually overslid and ended up going the wrong way! 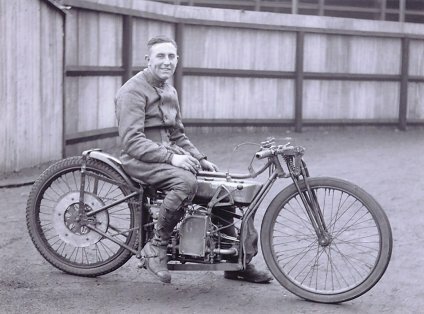 A good chance to look at the right hand side of an early bike though. Notice the hand operated gear lever just in front of the riders knee. Changing gear in the middle of a broadslide must have been a bit dodgy! 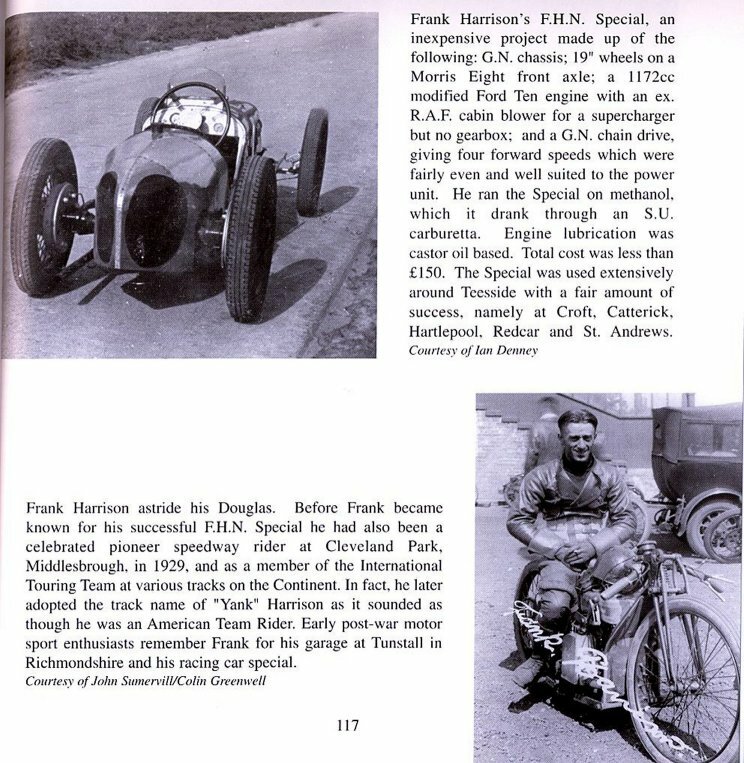 Jim Henry says: The Douglas did have a gearbox but it wasn't used during racing. The riders used second gear or, more usually, stripped out the gearbox of superfluous cogs so it was a set gear. 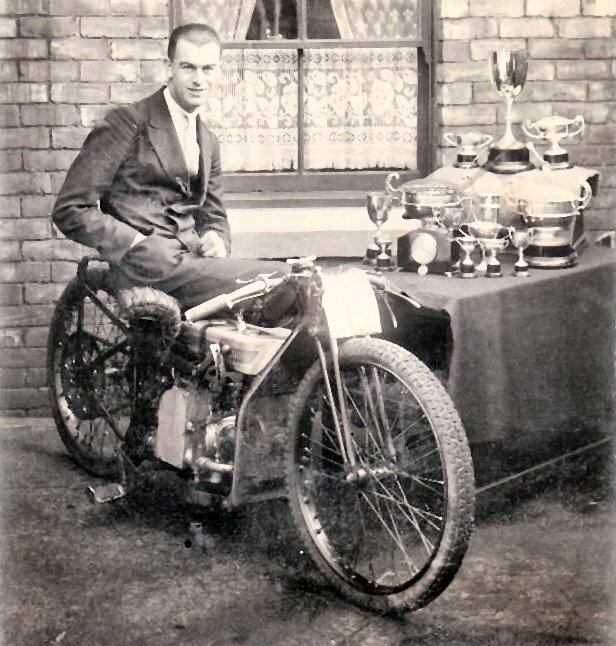 So speedway arrived at Brough Park on 17th May 1929 and Newcastle Brough contested in the English Dirt-Track League during 1929, finishing 9th out of 11, but the promoters "Newcastle Motor Racing Club Ltd.", dropped out of the league and by 4th July 1930 the promoters pulled out altogether. 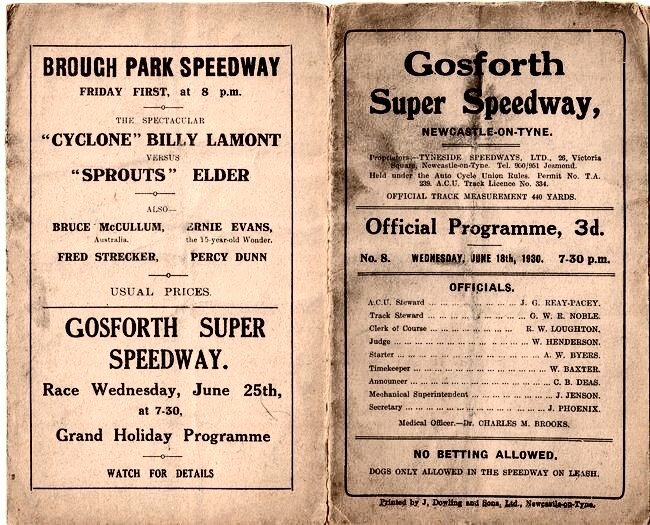 Brough Park had just made its first of many speedway shutdowns whilst the Greyhound company kept the stadium warm until speedway came back! For the rest of this page I have turned my attention onto Newcastle Gosforth who lasted a little longer than Newcastle Brough and Whitley Bay. Also 1929, but this time the track is Gosforth Park where Asda's store on Gosforth High Street is now! This was a heat from The Evening Chronicle Junior Speedway Trophy. The winner of the trophy was Sunderland's Ron. Dirkin. It is a pity that the picture didn't show the bends as the Gosforth track had very high banking some 3 feet high on the bends. This picture is the only one on the website that shows a push start. This is Gosforth's top rider Charles "Tiger" Sanderson. 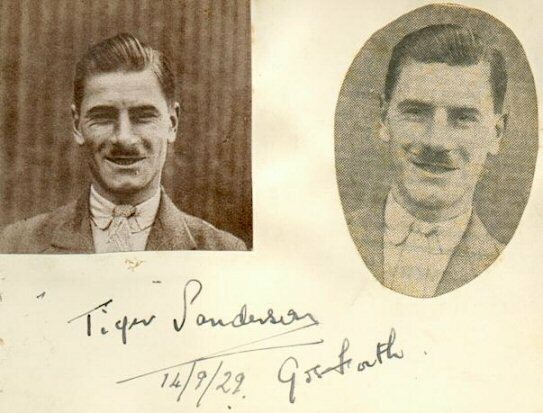 Tiger came from Fencehouses in Co Durham and was the star of the short-lived 11 meetings, Whitley Bay venture before the promotion closed the seaside town's track to concentrate on the Newcastle Gosforth venue. I like the right hand picture which shows Tigers waxed moustache! very cool man! Colin Greenwell says: I obtained the above page from my friends autograph book. Update! Teesside is to have a speedway again. 2006 will be graced by Redcar Speedway and that is great news for us in the North East of England! 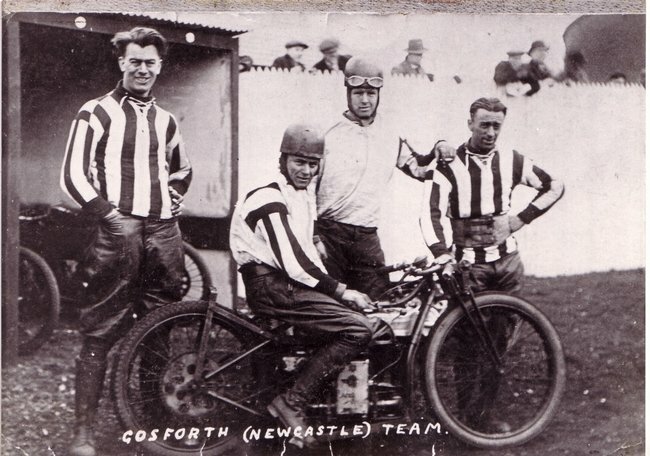 Newcastle Gosforth's 1929 team Harry Huntly, Jim Holden, Tom (Yank) Harrison and Arnie Cattell on the bike. The picture was taken at Manchester's White City when Gosforth were the visitors. 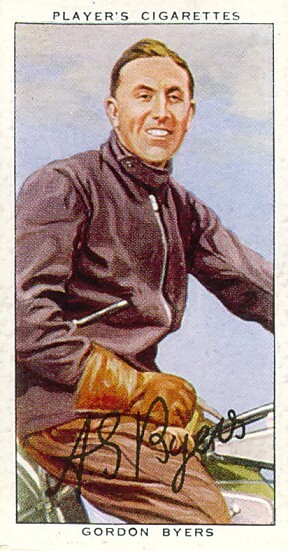 Items from a Gosforth programme from 1930 Showing Chester-le-Street's Harry Huntly and a number of other local riders. 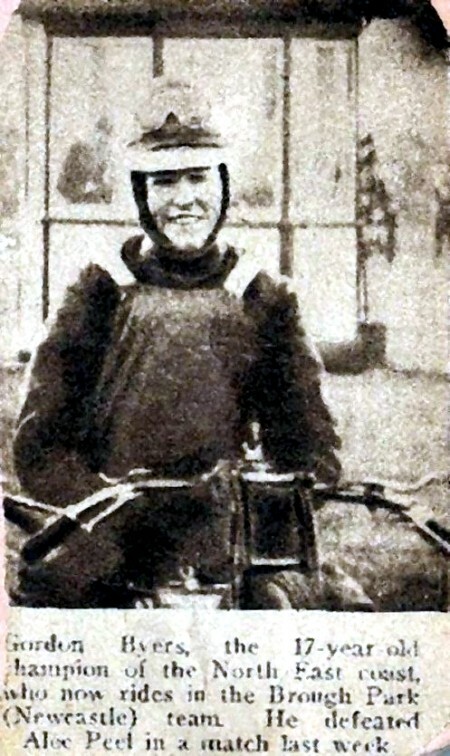 The programme notes inform us that Harry had just invested in a new machine, a Rudge so he would have had to adapt to riding foot forward unlike on his Douglas which required a leg trailing technique on the corners. Harry was 6ft 6inches tall so his leg would have trailed more than most! 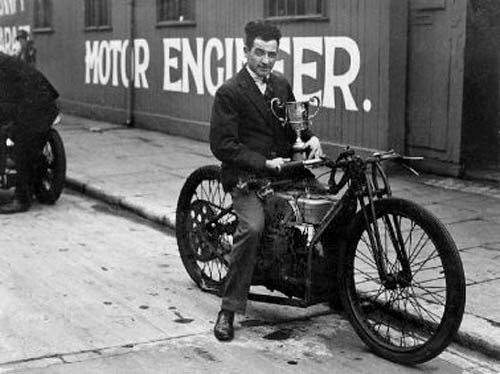 Switching to Rudge was the way forward as the Douglas had had its day so Harry must have had his finger on the pulse of the sport. 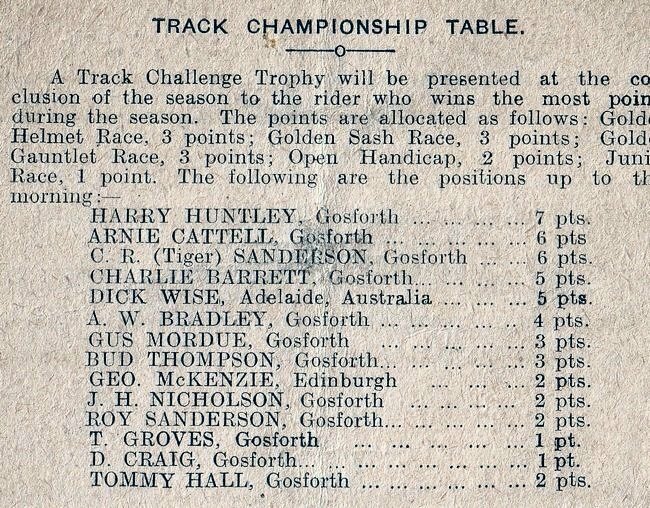 Harry heads the Newcastle Gosforth Track Championship Table. "The Tallest Rider Ever Built!" At 6ft 6inches or 6ft 8 inches Harry may well be the tallest rider ever built still? Here is an account of his meeting with Wally Lloyd who wasn't very tall! Chester-le-Street's Harry at Gosforth. Gosforth was famous for it's 3 feet high banking on the bends and in this shot you can get an impression of the banking. 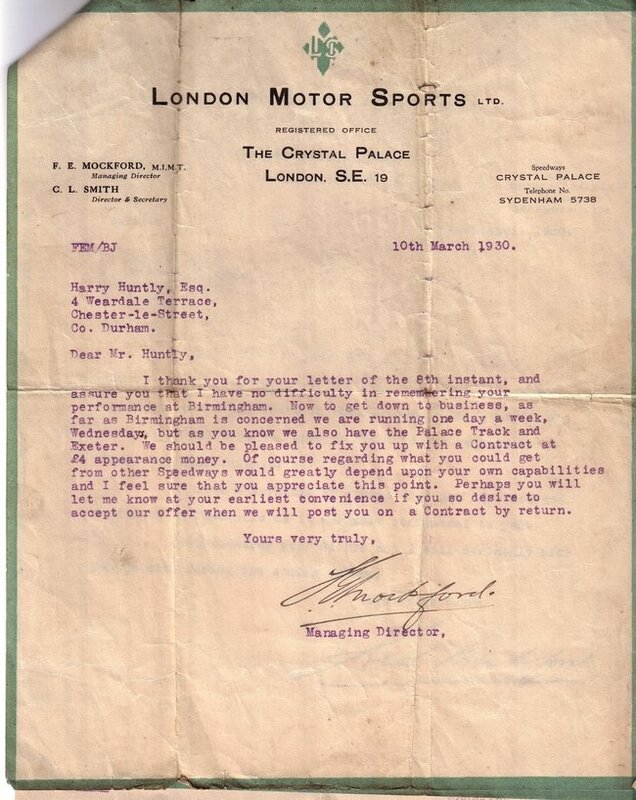 Here's an offer of a contract for Harry's service at £4.00 appearance money. Anyone care to convert that to the modern equivalent? Harry decided to stay northern based as he was working for his uncle and could get the summer off to concentrate on speedway. 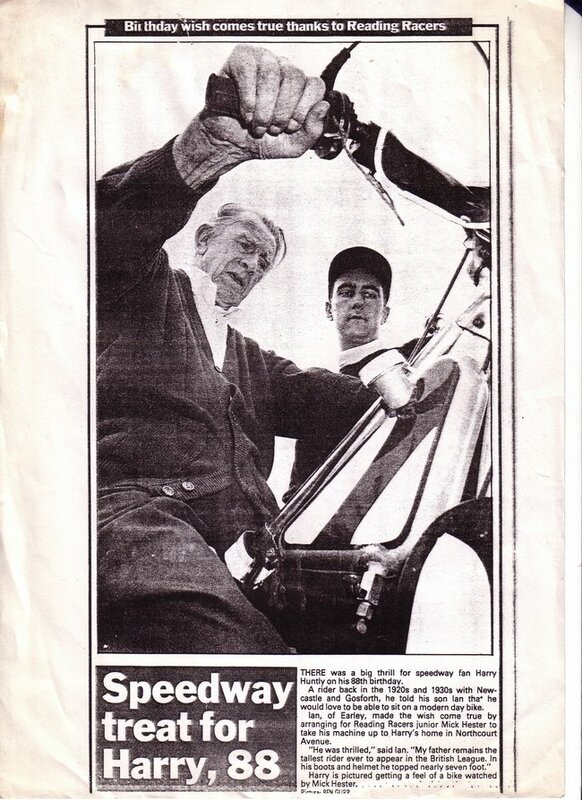 Here's Harry in 1995 celebrating his birthday by sitting once again on a speedway machine, courtesy of Reading Speedway. Sadly Harry passed away later in the year. 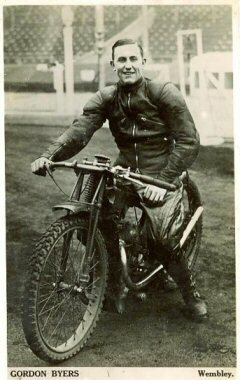 Leeds rider Eric Langton was a frequent visitor to Tyneside's 3 speedways in 1929, he really put the North East's riders to the test. 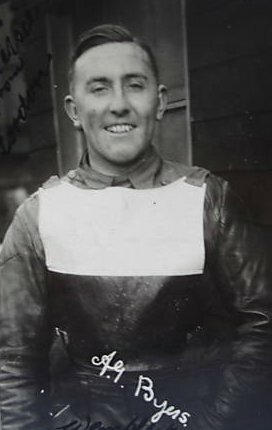 Local stars Walter Creasor (Brough), Tiger Sanderson (Gosforth) and Bud Thompson (Whitley Bay) must have been used to the sight of Eric's back wheel. 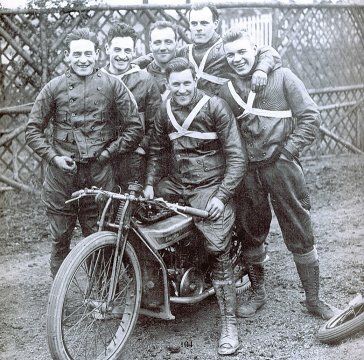 Riders received many novel trophies in the early days, gold and silver helmets, gauntlets etc. Here Eric is wearing a trophy on his head or maybe he just liked to look different!